The concluding day of The Tribune Real Estate Expo – 2019 was quite a heyday for many of the participating brands. 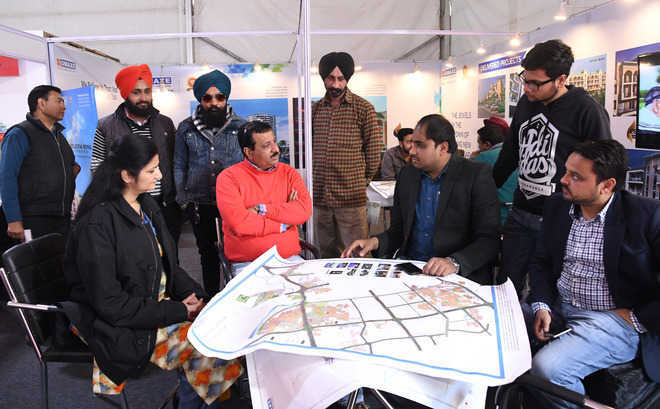 With a footfall of over 2,000 people at the venue in Sector 34, opposite petrol pump, builders received a minimum of 50 queries at each stall and some even managed to get bookings for their plots and flats. Chandigarh Royale City, however, was the only brand to have sold three flats, each worth Rs 1 Crore. “This expo has been quite fruitful for us. We have sold three plots, each spanning 200 sq yards worth Rs 1 crore. Also, we have received 120 queries,” said a salesperson of Chandigarh Royale City. While the WWICS received five site visits, many other brands, including Victoria Heights, Sushma Group, Riverdale Aerovista, NK Sharma Enterprises and SBP, received site visit conformations and were hopeful of sealing good deals in the coming few days. “This has been an interesting experience, especially because we received so many genuine queries and even now, three potential buyers are on the site visit,” said Sukhwinder Kaur of NK Sharma Group. “Also, the fact that these builders here are RERA approved helps one to make a more informed choice. We are looking for a house near Mohali. So, we have a plenty of options here. We are also comparing many options. So, this is as fair as it gets,” the duo said. Many leading brands, including Sushma Group, Omaxe, Victoria Heights, World Trade Centre, WWICS Estates, Maya Garden Magnesia, SBP Group, Vaneet Infra, Golden Sand, Royale Estate Group, PCL Gateway, Omega City, Hatil Furniture, Trends Furniture, Duraton Cement and Spier Floors, participated in the expo.